When Noah came out of Ark, G-d gave him instruction to be fruitful and multiply. But Noah wasn't fast to execute this commandment, coz he was afraid that G-d might terminate the whole world again in the future, despite His promise. Then Hashem made an oath to never bring World-Wide Flood again and showed a sign in the form of Rainbow in the sky. There was nothing like that before. G-d declared: "Here is the sign of Covenant! Each time when the world is going to be again sinful as much as it needs to be punished and fully terminated with the Flood, I will show the Rainbow in the sky, and I will remember my promise to never terminate the world with Flood again." Why is it precisely the Rainbow that was chosen to become the symbol between G-d and mankind? And why it became the symbol for those accepting Seven Laws upon themselves? G-d said: "When I brought the Flood, My bow was stretched against a man. 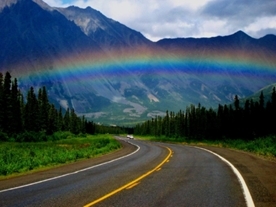 The Rainbow reminds of bow overturned, and it means "Celestial arrows" will never be sent to terminate mankind again." Since then, the Rainbow appears at the sky from time to time to assure us once again that despite our sins G-d won't terminate us. To all the rest, the Rainbow also serves as a reminder that if not G-d's Covenant, we would take the same punishment as Generation of the Flood. For Noah Descendants the Rainbow (together with Menora) became the symbol also coz it always reminds us about how much it is important for this world to exist that mankind must observe Seven Laws given to it since first man Adam times, and about that dreadful catastrpophe that disregarding with Seven Laws can lead to. However, the Sages say it's not good to put a fixed stare at the Rainbow, coz Shechina (G-d's presence - Biblical language translation) appears to the world in it. When it hangs among the clouds, one should take a fast look at it and read the blessing: "Blessed are You, L-rd, our G-d, King of the universe, Who Remembers the Covenant and Is Faithful to His Covenant, and Fulfils His promises." By this we remind to ourselves that G-d promised to never terminate mankind again, despite our sins. Such reminding should serve to wake up thoughts about self-improvement in people.